A book that debunks the popular myth that William Wordsworth was, first and foremost, a poet of daffodils, Wordsworth's Gardens and Flowers: The Spirit of Paradise provides a vivid account of Wordsworth as a gardening poet who not only wrote about gardens and flowers but also designed - and physically worked in - his gardens. Wordsworth's Gardens and Flowers: The Spirit of Paradise is a book of two halves. The first section focuses on the gardens that Wordsworth made at Grasmere and Rydal in the English Lake District, and also in Leicestershire, at Coleorton. The gardens are explored via his poetry and prose and the journals of his sister, Dorothy Wordsworth. In the second half of the book, the reader learns more of Wordsworth's use of flowers in his poetry, exploring the vital importance of British flowers and other 'unassuming things' to his work, as well as their wider cultural, religious and political meaning. Throughout, the engaging, accessible text is woven around illustrations that bring Wordsworth's gardens and flowers to life, including rare botanical prints, many reproduced here for the first time in several decades. 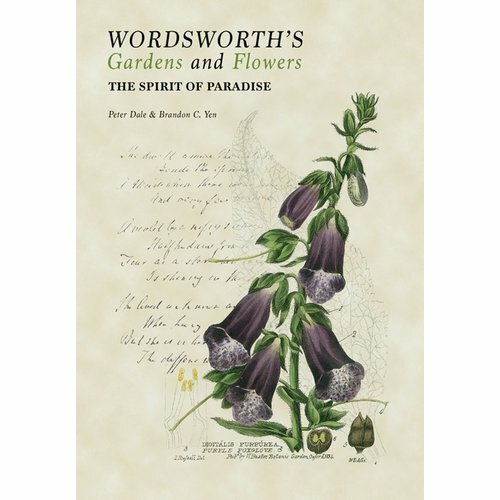 Wordsworth’s Gardens and Flowers: The Spirit of Paradise by Peter Dale and Brandon C. Yeo. ACC Artbooks. The prospect of creating a garden at Dove Cottage was not encouraging. The plot was “too small, too wet, too shaded, too incorrigibly uneven and irregular”. The land did face to the south-west and the soil was quite limey, but, being on the hill-side, it was quite thin and, in many places, it sloped steeply. In the Spring of 1799, after the Winter snows, Dorothy and William Wordsworth set about creating a garden at their new home in Grasmere. Dorothy was full of ambition. She’d dreamt of a garden that would be “adorned by magic”, where “the roses and the honeysuckles spring at our command”. They built a wall of slates across the front of the garden to protect the flowers from “the chomping droves of passing sheep”. At the back they let the garden merge into the fellside - “the wild and cultivated overlapped . . . an invisible stitching of garden into fell”. They collected the wild plants they found around them, the brooms and the ferns and the small mosses. Dorothy gathered primroses, foxgloves, honeysuckle, wild orchids and pansies and much else and it was the sheer density and diversity of plants which made the garden a cultivated rather than a wild place. William built a terrace from loose stones and, at the top of the garden, where it commanded a view over Grasmere Lake to Loughrigg Terrace and Silver How, he built the Moss Hut, “ a spider-crawling, musty-smelling, roof-dripping, rustic lean-to”, as Peter Dale describes it. They clothed the walls with honeysuckle, roses and Old Man’s Beard and, because of their sweet scent, planted them near the offices or privy. There would have been medicinal plants such as Self-heal, Feverfew and Eyebright and useful ones such as Soapwort which was good for whipping up a lather in the days before washing powders. And there would have been fruit trees. They enjoyed baked apples and there may have been a tree or two of the Egremont Russet along with the pear trees and the trees that bore the yellow Mirabelle plums. And gooseberries. Dorothy writes of stewing ten quarts of gooseberries together with 7 ½ pounds of sugar in the August of 1800. And, of course, in such a productive household, there were vegetables. Dorothy writes of radishes, turnips, carrots – they were white or purple rather than orange in the cottage gardens of Wordsworth’s time. They also grew potatoes and onions, broccoli, spinach, rhubarb and lettuces. They left Dove Cottage in 1806 and it was only seven years later, in 1813, when they settled in Rydal Mount that they had the opportunity to create another, more ambitious garden of their own. Peter Dale, himself a gardener, as well as a poet and musician, describes the various gardens that William Wordsworth created with an imagination and insight which brings one central facet of their life into sharp focus. His fellow author, Brandon Yen, an artist and writer, looks closely at the flowers which Wordsworth presented in his poetry. The daffodils are there, but they weren’t a solitary experience, but one shared with Dorothy as brother and sister walked along the shores of Ullswater. However, both William and Dorothy identify the Lesser Celandine – Dorothy used to call it Pilewort – as their favourite flower. It was a herald of Spring. Dorothy describes how “the little celandine glitters on every bank, the fields are becoming green, the buds bursting and but three days ago scarcely a trace of spring was to be seen”. This is a delightful book. It is itself as near as a book can be to a garden, with a wonderful range of botanical prints from the period. However, it is the knowledge and enthusiasm of the authors which reveals an unexpected paradise.